Central Texas Harley Davidson has teaming up with The KVET team and Devils River Whiskey to brings you the Hands on a Harley Contest where they will be awarding a 2018 Harley Davidson XL 1200X Sportster 48 motor bike to one lucky person. 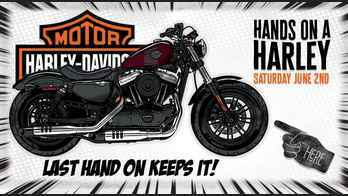 How To Enter The Hands on a Harley Contest? Listen weekdays at 7:20AM and 3:20PM for your chance to become a finalist for the hands on a Harley contest. Register online for your chance to become a finalist and place your hands on the Harley Davidson for your chance to win. When To Enter: The Hands on a Harley Contest beginning at 9:00 a.m. Eastern Time (“ET”) on May 21, 2018 until 02 June, 2018 09:00 – 17:00. Sponsor: Hosted by Central Texas Harley Davidson and Devils River Whiskey. Sweepstakes Prize: The Grand Prize Winner will receive the following (the “Grand Prize”): 2018 Harley Davidson XL 1200X Sportster 48 motor bike.